Before the age of 20 in white skinned. Before the age of 25 in Asians. Before the age of 30 in Africans. in mid-thirties in those who have fair skin with blonde hair, like Caucasians. in late-thirties in the case of those who have wheatish skin with brown to black hair like Asians. in mid-forties in those with black skin and hair like Africans. Your hair follicles contain pigmentation cells. These pigmentation cells are called melanin; that’s responsible for giving our hair the colour it naturally has. The higher melanin content your hair follicles will generate, the darker your hair colour will be. And similarly, the lower the melanin content generated by your hair follicles, the lighter your hair will be. As we grow older, there is a loss in these cells, which results in lessening the intensity of the colour and eventually loss of colour. When the melanin count decreases significantly at an early age, premature greying of hair is experienced. Eat balanced nutritious food rich in antioxidants and vitamins. Your doctor will advise you the nutrition chart you can follow. Your dermatologist does detailed evaluation to find the cause of premature grey of hair. If needed, your doctor might request you to check the levels of iron, folic acid, vitamin B12, copper thyroid hormones, etc. If test result shows any vitamin or mineral deficiency, then you might have to take supplements. If the thyroid hormonal profile is abnormal, the endocrinologist /physician advise will be sought. If the cause is treatable as in the case of medications, nutritional deficiency etc, there are chances of recovery. 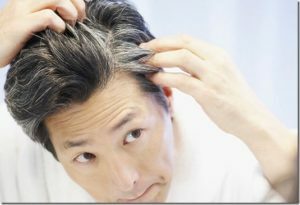 However, if the cause of greying of hair is hereditary with any family history , then the condition might respond partially, but, the total cure is unlikely.